The 1 PM visible satellite image shows the approaching front/low pressure system with substantial convective clouds behind it. The leading edge of the front is now stretching from Forks, on the NW coast, to NW Washington. The latest radar indicates showers along the coast and over NW Washington, all of which are reaching the surface as rain. A few snow flurries have been noted around the region. The latest sounding above Sea-Tac airport (12:30 PM) shows a freezing level around 950 ft, which means the atmosphere is now close to cold enough for snow to reach sea level. This morning's model output suggests some warming aloft this afternoon. However, the time-height cross section above Seattle does not suggest much cooling aloft, which gets me worried, as does the fact that temperatures are cooler than forecast. Thus, I have some concerns that we might see a switch to snow earlier than forecast over Puget Sound (which was around midnight) and during a period when precipitation is heavier (after midnight there are only a few snow showers). I am also concerned that the upper level pattern (see 500 hPa heights below for 1 AM Sunday) looks fairly close to the canonical snow pattern. In such a situation difficult, rapidly changing situation, one turns to the HRRR...the constantly updated NWS High Resolution Rapid Refresh model. 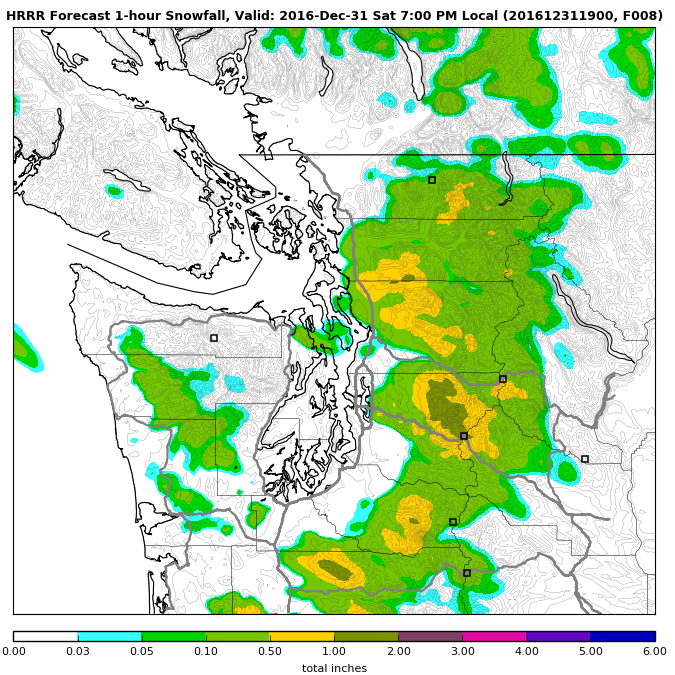 The 1-h snow forecast ending 4 PM shows snow reaching the surface over NW Washington. By 7 PM, there is light snow reaching Everett and the eastern Seattle suburbs. The snow areas are where the precipitation rates are large enough to drive the snow level to the surface. 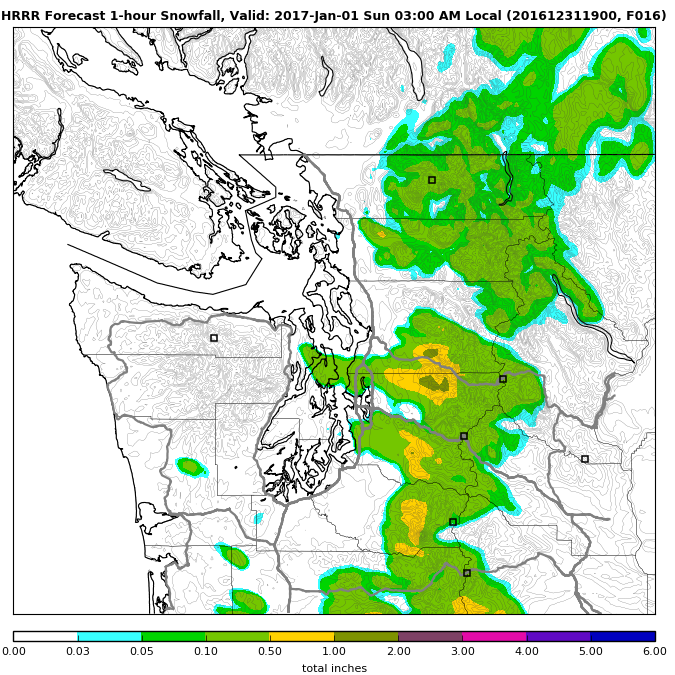 The 2 AM and 3 AM forecast show snow over Puget Sound (particularly Snohomish County and north King County in a convergence zone. This is an extraordinarily difficult forecast because the temperatures are so close to the line for rain versus snow. The classic western WA dilemma. And above is only one solution. 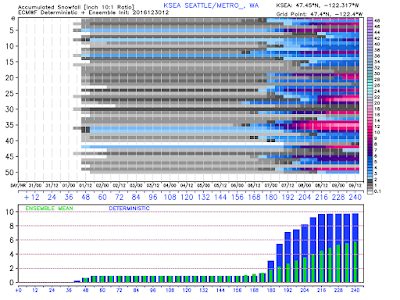 There are large uncertainties in the model solutions (see NWS Short Range Ensemble Forecasts of total snow) for Seattle from nearly no snow to several inches. 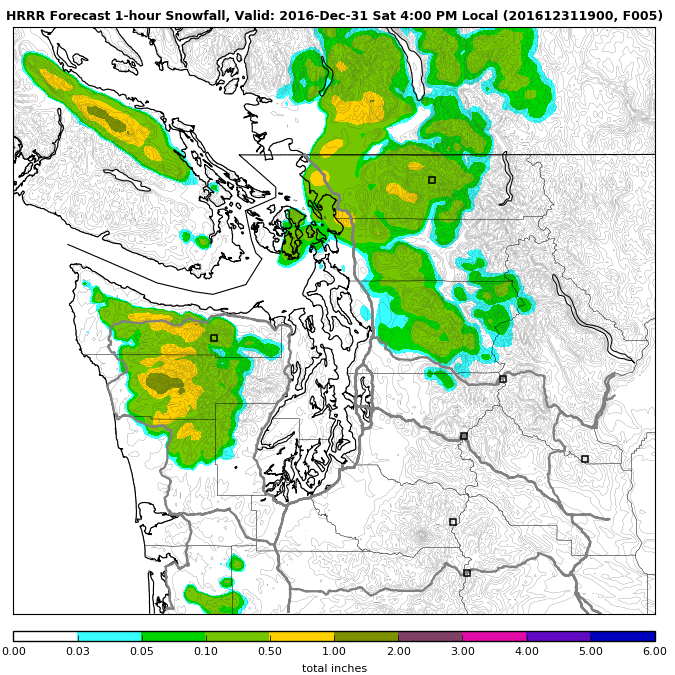 The bottom line: there is a good chance of snow showers later this afternoon and evening, particularly north of Everett. As the atmosphere cools down further later this evening and a convergence zone sets up, several inches could fall north and east of Seattle after midnight. Will have to watch this situation very carefully during the afternoon, as my colleagues at the NWS will certainly be doing. New Year's Eve Snow for the Puget Sound Lowlands? 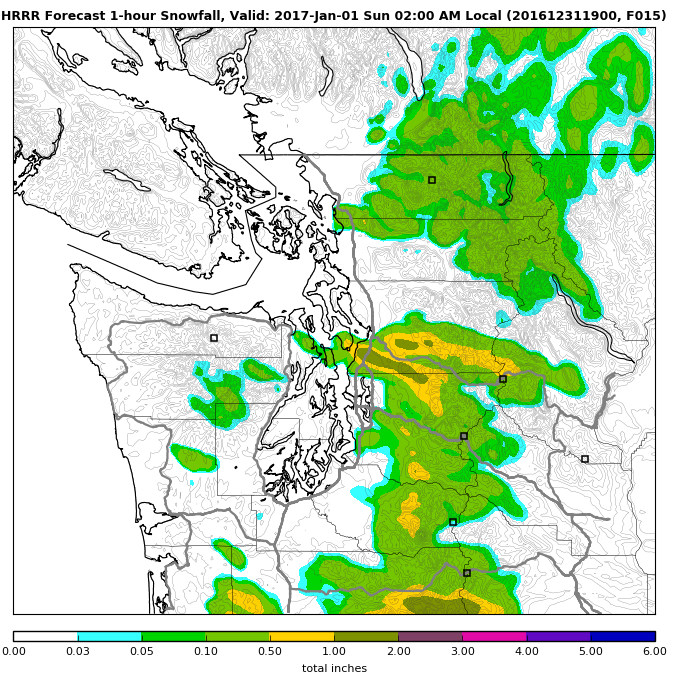 I will have an Update at 1 PM Saturday-still looks like a light snow event after midnight... strong winds tomorrow over NW WA. And much colder. More later. Confidence is high in a transition to much colder temperatures over the Northwest starting on Sunday, but what about lowland snow around Puget Sound? 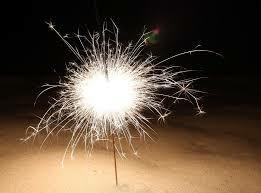 Will there be snow flakes flying as folks return home from their New Year's celebrations early Sunday morning? Perhaps...but not too much. The general situation for Saturday/Sunday is clear. As shown in the upper level map for 4 PM on Saturday, an upper level trough will move southward over the Northwest (with ridging over the Gulf of Alaska). The trough will provide upward motion that brings clouds and precipitation, and as it passes, cold arctic air from the continental interior will sweep south and west over our region. By 1 AM Sunday morning, cold air (blue colors in surface chart below) will be moving into Washington State, with a trough of surface low pressure just south of Seattle. At 10 AM Monday, very cold air has spread over the Northwest, with easterly flow pushing the frigid, arctic flow over the Pacific. Although we will have both upward motion and cold air, the configuration above it not ideal for much snow. For substantial Puget Sound snow one wants the upper trough to extend farther offshore, with the associated surface low moving southward along the coast. That would both draw cold air southward and provide precipitation at the same time. So what do the models show? 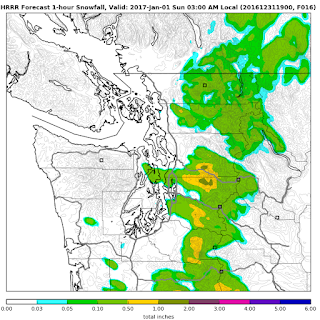 The European Center ensemble (many model) snow total prediction for Seattle suggests only light snow, mainly after midnight--perhaps .5 to 1 inch. A much greater risk is suggested for next weekend (roughly 6 inches). The high-resolution European Center snow forecast through 4 AM Sunday shows light snow over the west (0-1 inches around Puget Sound near sea level, 1-2 inches near the Cascade foothills. The National Weather Service (GEFS) ensemble forecasts shows a mean snow total around 1 inch by Sunday AM. This is snowfall, not snow depth. So the bottom line in all this is that you should expect increasing clouds on Saturday as the trough approaches. Light rain will begin over the lowlands around dinner time and then transition to snow showers between 10 PM Saturday and 1 AM on Sunday. A few hours of light snow will follow before the atmosphere dries out on Sunday in the cold air. 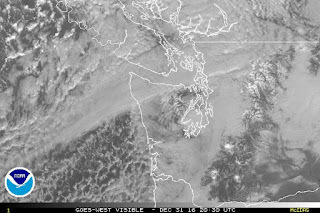 Much of the lowland snow will be focused on a Puget Sound Convergence Zone over north Seattle and the arctic front--the zone of transition to the cold, continental air. Most of the region will end up with little to perhaps an inch of snow. Not a big event, unless our forecasts are way off. 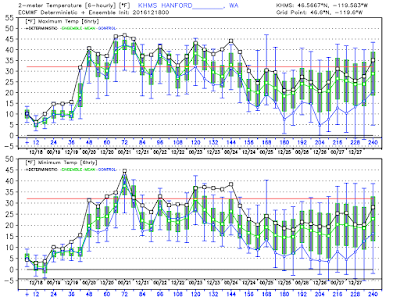 As noted earlier, the cold forecast for next week looks solid... the coldest period around here since December 2008. 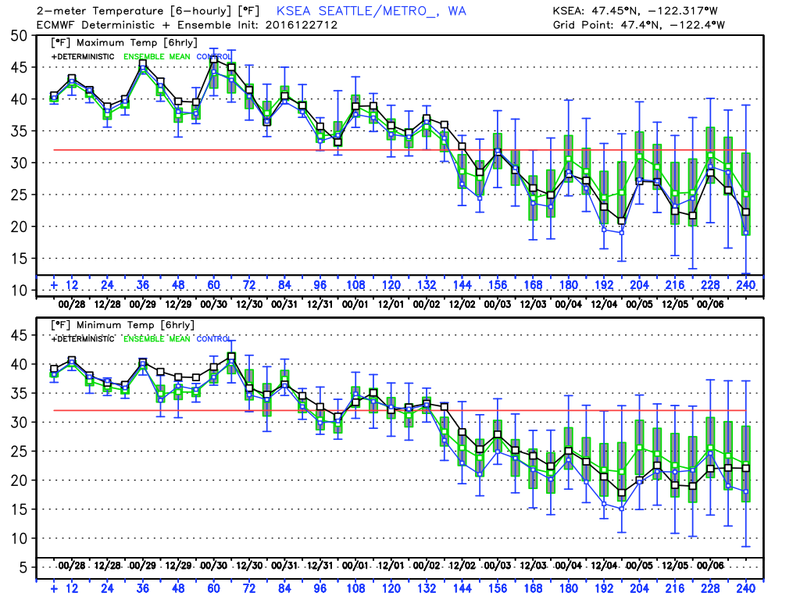 The latest European Center forecasts for high and low temperatures at Seattle suggest highs near freezing and lows in the mid to lower 20s for Monday through Thursday. Teens in cooler locations away from water. Good time to remove exterior hoses, protect faucets, and block exterior vents. And keep pets inside. The regional radar image at 2 PM was amazing and dramatic (see below). Moist flow from the west is approaching our coast, rising on the western side of the Olympics and sinking on its eastern side. The result is distinct hole in precipitation to the lee (east) of the Olympic barrier....a rainshadow. 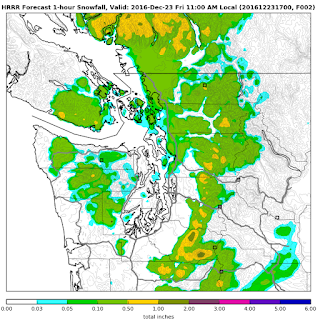 As the air rises again on the Cascades, precipitation reforms. Why is the rainshadow over Seattle to Everett rather than over Sequim? 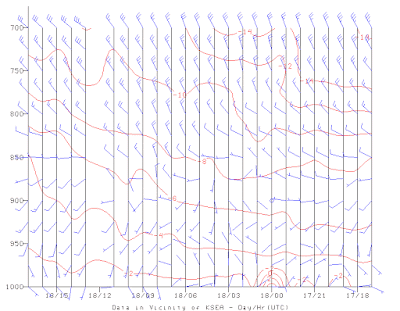 Because of the westerly wind direction aloft rather the typical south-southwesterly flow of winter. But what is really exceptional is the satellite imagery. Here is the image from the NASA MODIS satellite...you see the black, cloudless "hole" downstream of the Olympics. It is sunny there! Here is a blow up of the "cloud shadow". Really dramatic. Although temperatures have been relatively normal for the last few days, the last month has been decidedly colder than normal over the Northwest, as suggested by this map, which shows the deviation from normal for the past 30 days. Much of our region has been 2-4F colder than typical during the past month. Such cold temperatures have brought us a very healthy snowpack. But the latest model runs are suggesting a much colder period next week, one that would be far colder than we have seen in many years. Since we are looking forward in time for an extended period, we must think probabilistically and thus I will show you mainly ensemble (many forecast) output. 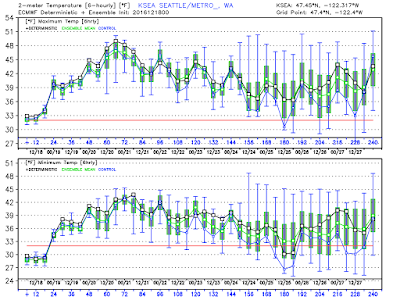 We can start with European Center ensemble forecasts (51 forecasts) for surface temperatures (max and min) over Seattle. The range of their ensembles are shown by the blue bracket, while the ensemble mean (often very skillful) by the green line. Their single high-resolution run by the black line. 50% of the ensemble members are within the green box. 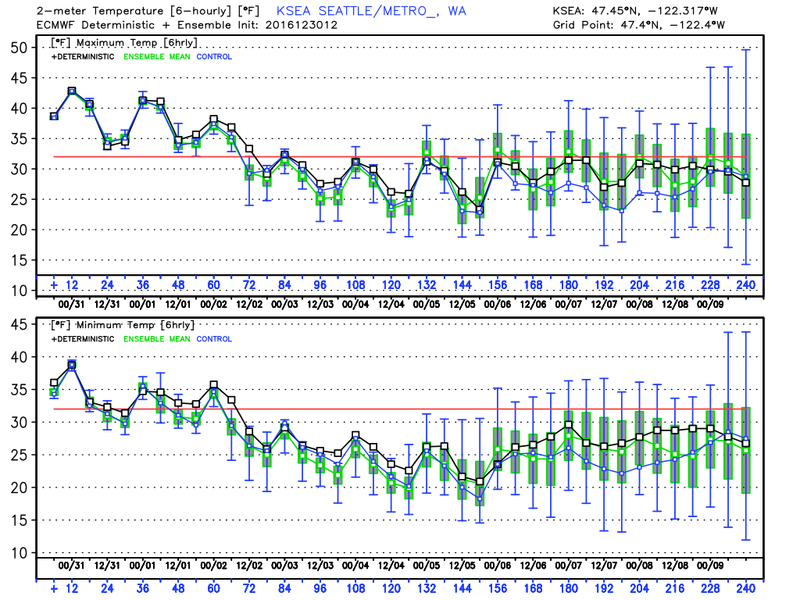 Note that just after the new year, the high temps drop below freezing and then plateau out around 25-28F. But uncertainty gets large as well. The US GFS ensemble, shown below, does something similar (Seattle temperature shown, ensemble mean indicated by the black line, high-res member, blue line). Much colder next week, but with substantial uncertainty. The forecast surface weather maps for next week based on the high-resolution NWS GFS model are chilling, with cold air (blue colors) extending over the whole region. The latest weather.com forecast (which is generally excellent) is going for cold and sunny early next week as the cold, arctic air spreads south. Is there a chance of snow as the cold air moves in? The answer is yes...but the uncertainties are too large to speculate on that now. I feel sorry for those Northwesteners who have travelled to warmer climes over the holidays....they are going to suffer terribly next week, while the cold-hardened folks who remained will be more comfortable. Generally, air quality is very good over western Washington due to the long over-water trajectory of air reaching our shores, but today there is a modest degradation (yellow colors) over some of the most populated areas (see graphic). Why? Lots of folks like to rev up their fireplace or wood stove for the holiday, and with cold air at low levels and high pressure aloft, a layer of stable air is found aloft. 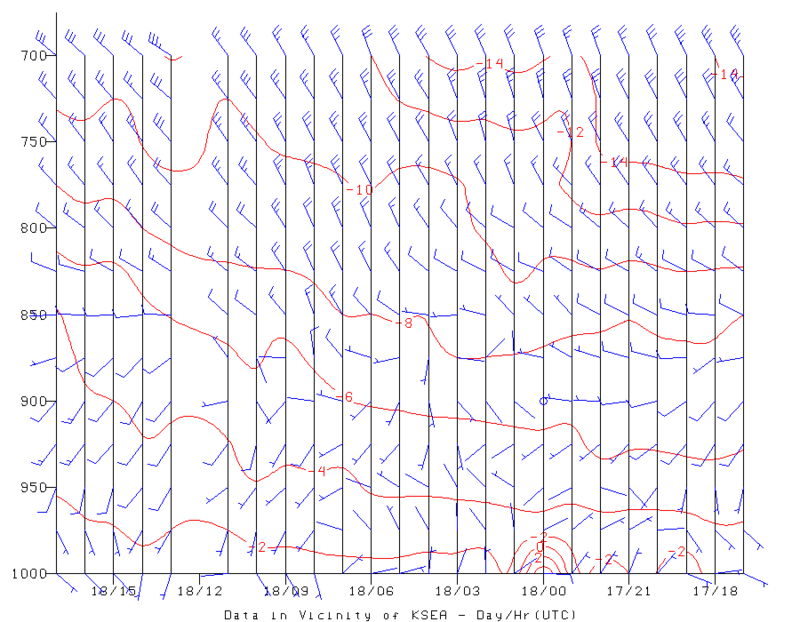 This stable air is indicated by a layer from roughly 50-m to 300 m aloft over Seattle where temperatures stay the same or warming a bit with height (inversion). 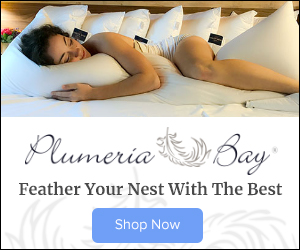 As noted above, our air quality is relatively good because winds in the midlatitudes are from the west and thus our air comes over the vast Pacific Ocean--although a small amount of Asian air pollution does get across. To illustrate our source of air today, below are backwards air trajectories (paths of air in space) for air parcels ending near the surface, 500 m aloft, and 1500 m aloft from the wonderful NOAA Hysplit system. At all levels, our air came from the north Pacific, with the air parcels rising from near the surface to around 7000 ft before descending again over us. A summary of air quality in Seattle for the past year is summarized below (green is good air quality as shown in the legend above). Mostly green (good quality) with a sprinkle of yellow (moderate) days like today. The same plot for Los Angeles show many more moderate days and occasional poor air quality periods (dark orange). Beijing would be orange or red nearly all the time. I have a visitor from Beijing and she is impressed with the wonderful quality of our air. Something to be thankful of. U.S. air quality improved substantially starting in the mid-70s due to a bipartisan national program to clean-up our air (e.g., U.S. Clean Air Act, EPA, etc.). If only we could be wise enough to foster a bipartisan effort to deal with increasing levels of greenhouse gases. 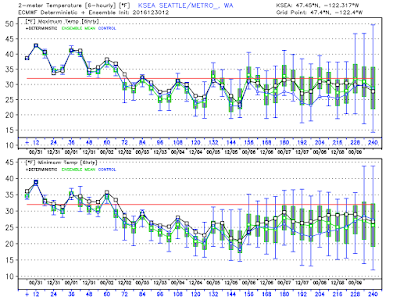 It is the old story, the temperatures are marginal for snow near sea level around western Washington. At 10 AM, some locations around Puget Sound were reporting mixed rain and snow, and some higher elevations (like Paine Field in Everett) were all snow. However, the temperatures aloft are relatively warm and the road surfaces have warmed after our relatively balmy weather. So not much is sticking. But you can see flakes on some web cams (see one near Paine Field below), with some whitening on grass. The issue: warm temperatures above. A plot of temperature with height at 9:30 AM shows a freezing level of 1750 ft, which implies a snow level of 750 ft. Yes....the higher hills could get some accumulation, but not much near sea level. 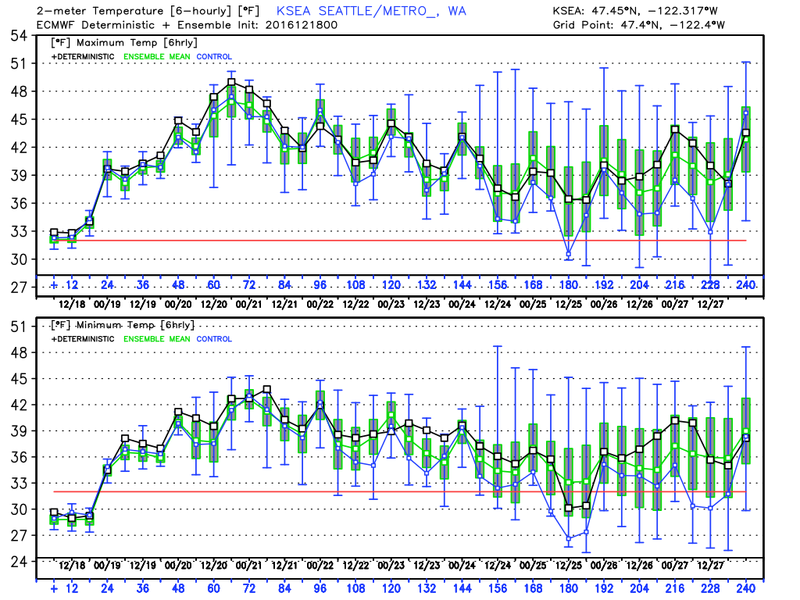 A plot of temperatures aloft (over Seattle) in time, shows -2C air at 850 hPa (around 5000 ft). That is extremely marginal for snow, particularly when one does not have cold air in place at low levels. The forecast pressure pattern is also not favorable, with a low center right over us and no feed of cold air from the Fraser River Valley (see forecasts of pressure and temperatures for 10 AM below). Bottom line: if you are near sea level, you will not see much and there is very little risk of significant snow. If you are above 500 ft, you will see some very light accumulations. More over Whatcom county. Sorry for folks wanted a white Christmas at sea level. But there is plenty of snow in the mountains. Where to go for a dry vacation? The holiday break period is looming and folks want to know: where will it be dry? Well, to answer that question, below is the 1-week precipitation total from the National Weather Service GFS model. Western WA and British Columbia: wet. In fact, wet along the entire West Coast, including California. Northeast and central U.S.: wet. You want to be dry in the lower-48 states? Eastern Colorado is a good bet as the Florida panhandle. For completely dry conditions, head to Mexico: Cabo San Lucas and the central/southern Mexican coast looks good. Here in the NW, wet is the word. The forecast for the next 3 days, indicates several inches for western Oregon and northern California. The next 72 hr moves the focus of the rain back to the Northwest and southwest BC. Finally, let's take a look at our latest snowpack numbers--and they look good. The Olympics and western Cascade slopes are generally at 120-150%, with eastern WA roughly 75-90%. With a good snowpack and all the regional reservoirs above normal, water resources for next summer looks good. Why is Climate Research Important? The media is full of headlines regarding the potential elimination or reduction of U.S. climate research by the Trump administration. There are two groups that question the necessity of climate research and they are, strangely enough, on opposite sides of the political/environmental spectrum. On one hand, there is the "climate hoax" contingent who believes that climate change is a Chinese invention to undermine the U.S. economy or a liberal plot to increase government and take control of our lives. On the other hand, there are those who suggest that climate change is "settled science" and society has all the information it needs to act. That "97% of climate scientists" agree on what will occur as greenhouse gases increase. The dangers of the "settled science" group was made clear in Australia, where the conservative government fired climate scientists in CSIRO with the claim that the science issues were now clear. I will suggest that both are profoundly wrong and that research is acutely needed to understand and project climate change forced by natural processes AND human-enhanced greenhouse gases. In this blog I will describe the importance of climate research and will discuss weaknesses in our understanding of human-caused climate change that are rarely admitted by scientists or discussed in the press. Weaknesses that must be addressed. So why is climate research so important? Let me give you a few reasons. Reason #1: The is Still Lots of Uncertainty of What Climate Change will Bring both Globally and Locally. Both basic scientific principles (e.g., the physics of radiation) and our most comprehensive climate models strongly suggest the earth will warm as greenhouse gases increase. Importantly, as our global climate models get more and more complex, the uncertainty in their projections (the range of potential outcomes they suggest) has NOT CHANGED IN DECADES. Our best estimate are that a doubling of CO2 results in a range of roughly 1.5 to 4°C iincrease n global temperatures. We would have said the same thing 30 years ago. Uncertainty in the amount of greenhouse gases there will be emitted and retained in the atmosphere. Uncertainty in how the land surface will change. Major uncertainties in model physics, such as how clouds form or how energy is exchanged with the surface. Inadequate resolution of the global models, making them unable to properly deal with topoography. Many global models fail to properly simulate natural variability, like El Nino/Nina and the MJO (Madden Julian Oscillation)....to name only few. Research is needed to reduce ALL of these and other sources of uncertainties. The uncertainty of the local impacts of global climate change is even larger than for global changes. Lack of resolution in global models means they don't properly handle local terrain, land-surface conditions, and land-water contrasts to name only a few factors that have huge impacts on local weather and climate. To deal with local conditions, either the global climate models need far higher resolution or intense research/development into regional climate modeling is required, something a group of us is trying to initiate here in the Pacific Northwest. Reason #2: Current climate climate models are "tuned" to reproduce the current climate and thus may have serious deficiencies. They may not be adequate for projecting future climate change. 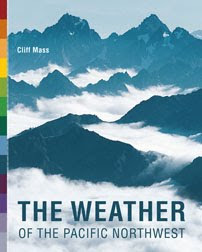 A piece of dirty climate-change laundry is that our current climate models can not duplicate the current climate without "tuning" some parameters for which there are uncertainties. The fact we have to do this reveals that there are still deficiencies with our knowledge and/or ability to simulate the climate. Does this impact our ability to predict the implications of increasing greenhouse gases? We simply don't know. Reason #3. There are many uncertainties in critical physical processes. This reason is related to #1. How will a warming climate impact sea ice? Will large amounts of currently frozen methane be released? How have small particles (aerosols) changed over the past 100 years and how has this impacted the climate system? I could list dozens more of these: important processes we don't understand well, including how they will interact with a warming planet. The bottom line is that our current climate modeling technologies have deficiencies, both on global and local scales. We have a lot to learn about basic physical processes that are critical for climate prediction. There is a huge amount of work for climate scientists, earth sciences, meteorologists, and oceanographers to work on. The science is not settled or certain other than there is little question that the planet will warm. To determine how serious the climate change threat from increasing greenhouse gases will be. The U.S. will spend trillions of dollars on infrastructure (e.g., dams, roads, reservoirs, etc. ), shouldn't decision makers have available the best possible information on what we expect to happen during the next century? 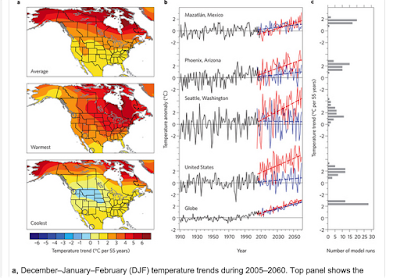 So even if you have your doubts about climate change (like Trump and some Republicans), doesn't it make sense to do the research needed to strengthen the underlying science and to reduce the uncertainties? If you are one of the environmentally committed that have no doubt about the reality of climate change, isn't it prudent to get a better answer on what we expect will happen as the concentration of greenhouse gases increase? The U.S. has the preeminent scientific resources in the world regarding many of the basic science issues dealing with climate change. It would be a disaster for a Trump administration or any other to dismantle a scientific capability that took a half-century to create. Ignorance of the future is no advance for Republicans, Democrats or anyone else. Our region has endured one of the coldest periods in a few years, with teens west of the Cascade crest and single digits/below zero to the east. 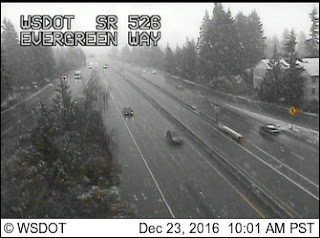 And now, some light snow is falling over NW Washington. But things are changing aloft, with warm air pushing in above us. Normal temperatures (40s) and rain are in the forecast. 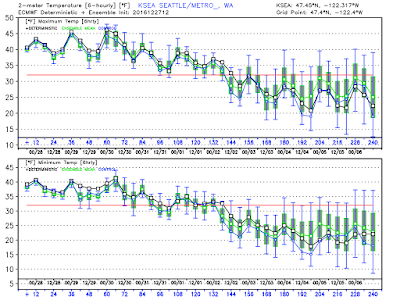 The temperature traces over the past four weeks for Seattle and Pasco are enlightening...if not chilling (red and blue lines are average highs and lows, respectively). In Seattle, we have have been cooler than normal for the past two weeks, and the last few days were particularly frigid, with our high temperatures remaining below our normal lows. But if you want to be impressed, check out Pasco in the TriCities, where the recent temperatures have gyrated down to nearly -10F. That is cold. The origin of all our cold weather has been the combination of high pressure (ridging) offshore and low pressure (troughing), as illustrated by the upper level (500 hPa) map for Friday morning at 4 AM. The forecast map for 4 AM Monday is very different, with much more zonal (east-west flow) as a result of a weakened ridge/trough. Back to normal. The light snow is a sign of the warming, with the movement of warm air into the region associated with upward vertical motion. 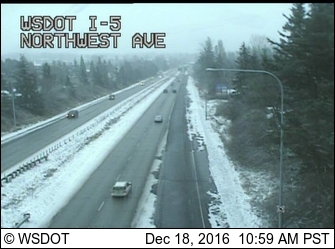 So far it has been mainly a dusting, as suggested by the latest cam shot near Bellingham. What is going to happen now? The meteorologically enlightened prefer to use ensemble forecasts and a probabilistic viewpoint, so here are min and max temperatures forecast by the European Center model for Seattle. The range of possibilities is shown by the blue brackets. The ensembles are emphatic about a warm up (you can bet on that! ), with highs reaching to near 48F in a few days. A slow cooling follows, but there is increasing uncertainty past a week. Enjoy the warmth...it will feel nearly tropical after what we had. 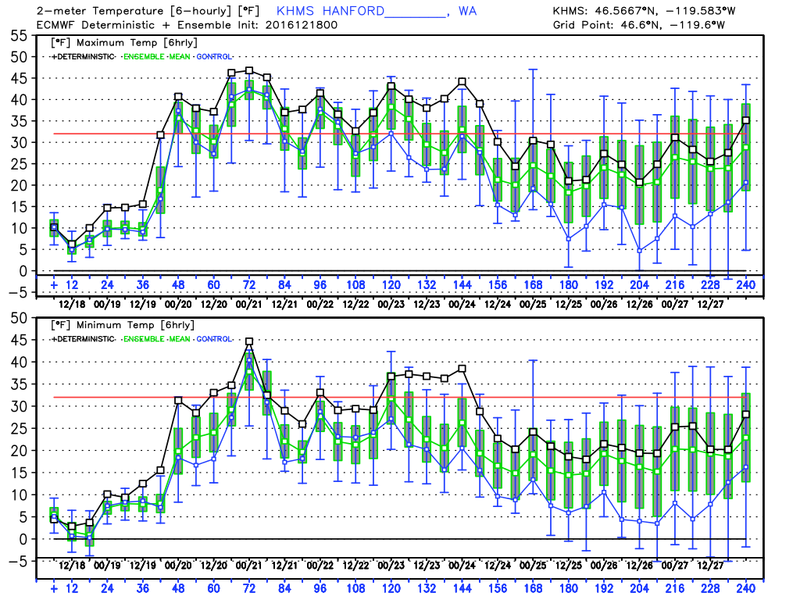 The Tri-Cities will have to wait a few days, as shown by the predicted temperatures at Hanford. But they will enjoy some thermal relief as well.